In my opinion, long weekends in Paris (when the weather is nice) are for being outside! If, however, you can’t find a coveted spot on one of the sunny terrasses, then getting some food to go and eating in one of the closest parks is always a great option, especially if you’re in a hurry! This long weekend I discovered Gustave, a trendy new sandwich joint in the always trendy South Pigalle (SoPi) neighborhood. 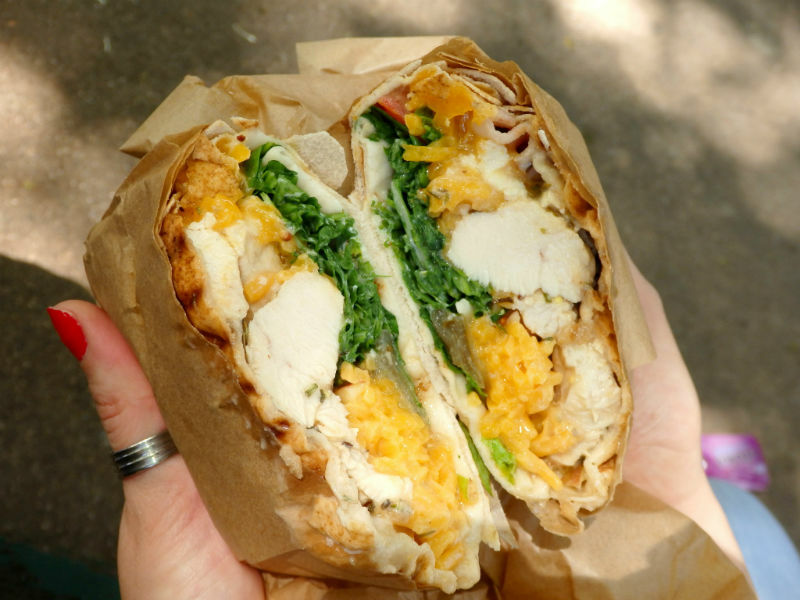 Gustave serves up their own creation called “claps”, which are whole wheat flour tortillas (or thin pitas) stuffed full of a variety of yummy ingredients, folded up tightly into a square, and then grilled until toasty. The little shop is located on rue Henry Monnier, a total foodie street, just across from Buvette Gastrothèque and Luz Verde. It is tiny inside, with a few chairs and small bar table along the window, and decorated with only a deer’s head and some tattoo art on the wall… for that hipster touch. 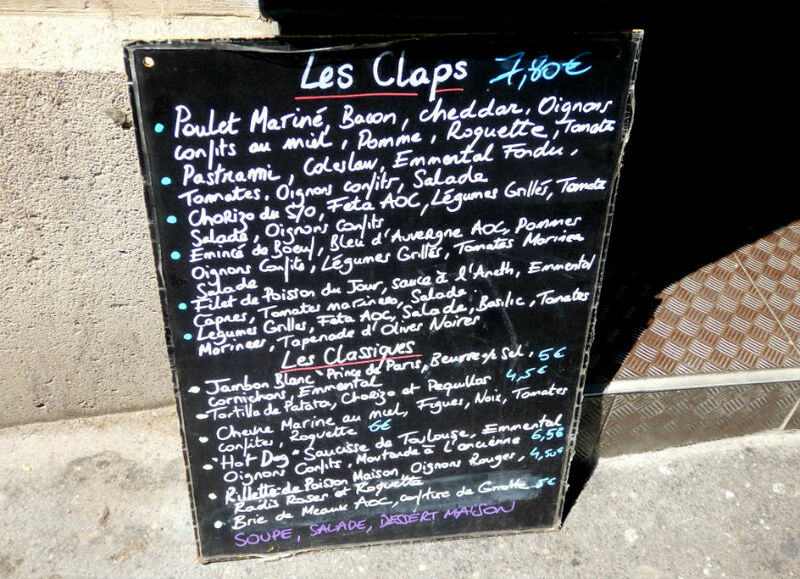 The menus is simple: claps are 7,80 Euros, a claps and drink are 10 Euros, and a claps, drink and dessert are 12 Euros. 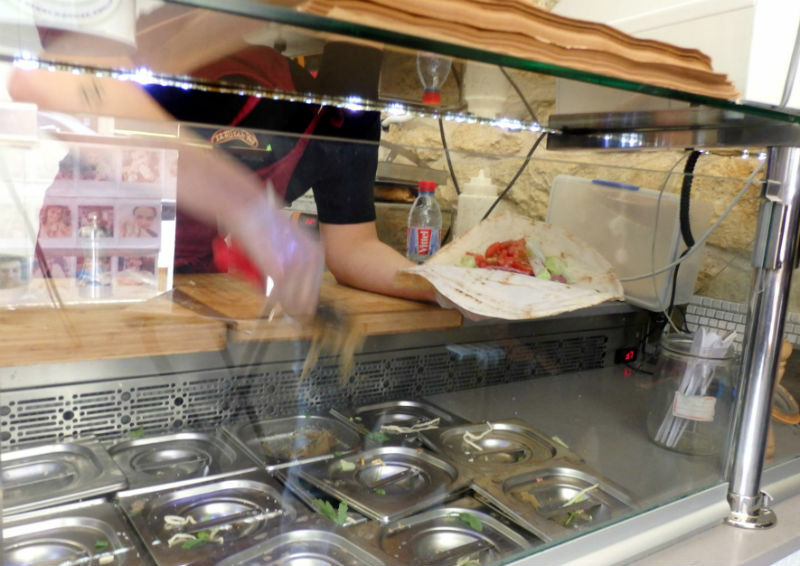 They also have a selection of baguette-style sandwiches (4.50-6.50 Euros), for people who like to stick to something a little more traditional, as well as soups and salads. When I arrived with my friend M, there were already a couple sitting on the two-person bench outside and to their left we saw the chalk board menu with the list of fillings to choose from. There were so many choices (including a daily special), but after reading them all carefully and consulting with two guys who were self-proclaimed “regulars” we decided on 1) marinated chicken, bacon, cheddar, honeyed confit onions, apples, arugula and tomatoes and 2) pastrami, coleslaw, Emmental cheese, tomatoes, confit onions and lettuce. I have been back since (yes I know…twice in a space of 72 hours! But I was in the area!) 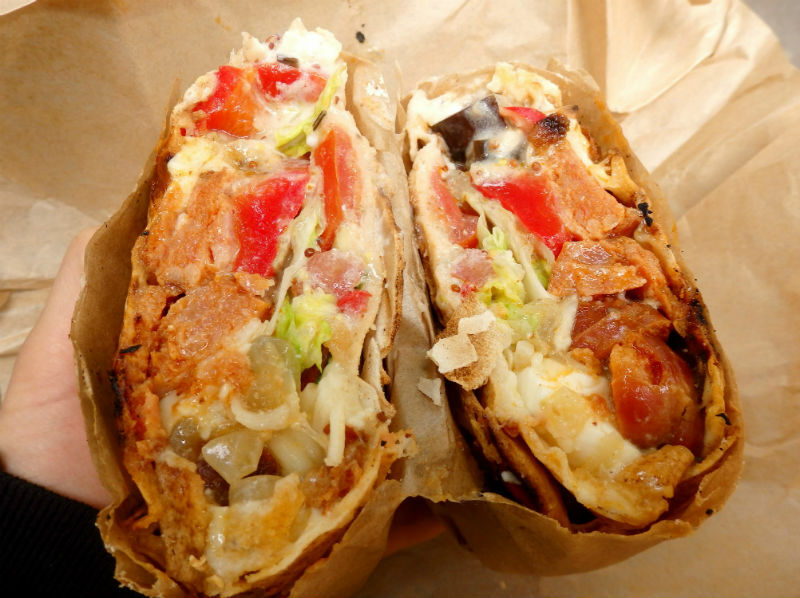 and have also tried the one with chorizo, feta, grilled veggies (big chunks of eggplant, red peppers and potatoes), tomato, lettuce and confit onions. 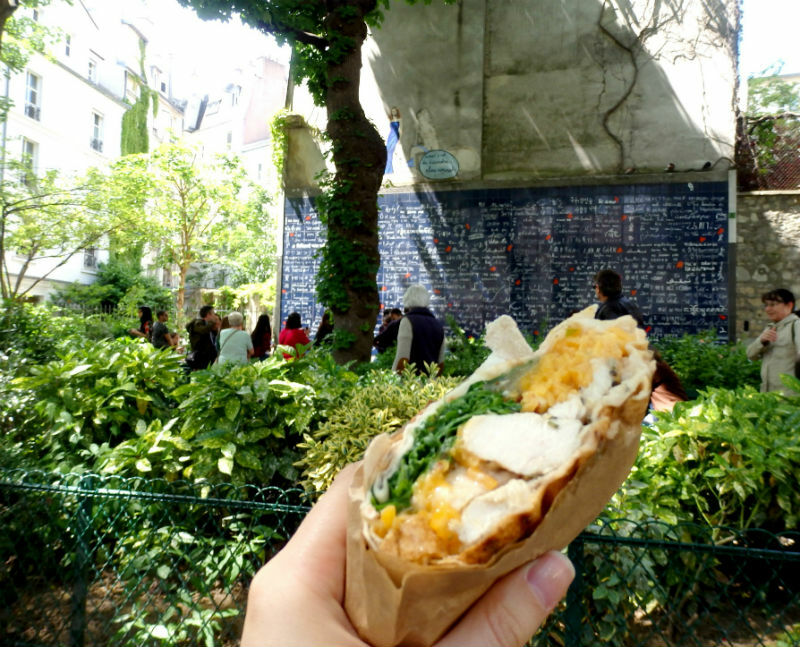 We took our carefully bundled sandwiches, walked up to Abbesses, and sat on a bench in a little park just behind the Métro with the “I love you” wall in front of us. We unwrapped them like presents and were instantly drooling over the colorful display in our hands. At this point I am going to have to say: Warning: They are VERY hard to eat without “food juices” from the dressing and marinades dripping all over you! So, if you are about to go to a job interview in your best suit and you need a quick lunch, I wouldn’t tempt fate with one of these. Similarly, if you’re not totally comfortable with the person you’re with, then choose something else. But, if you want something full of flavor and don’t give a s#*@ about how messy things might get, then you are sure to enjoy these sandwiches! My fave was the chicken and bacon (total perfection) followed by the chorizo (which was the messiest to eat, if you’re wondering, thanks to all the yummy veggies). 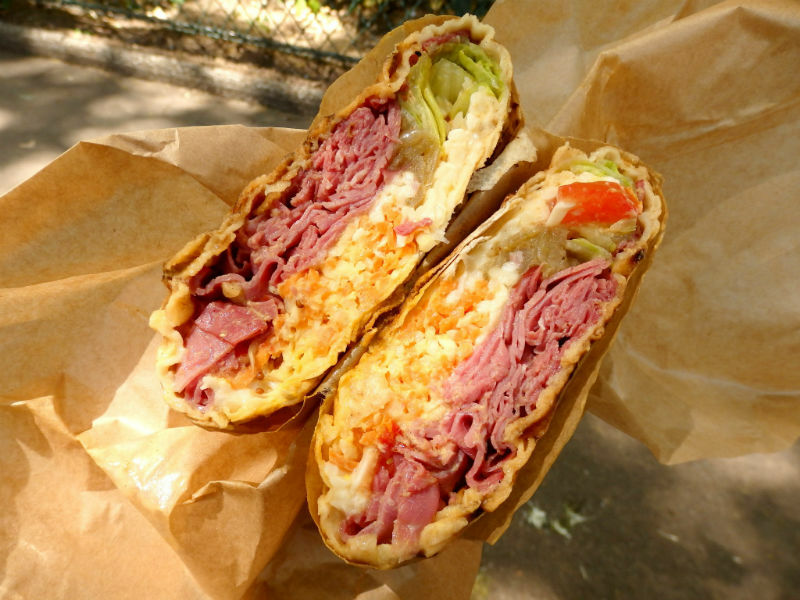 The pastrami was also good, but I have to admit that I’m used to having some sauerkraut or pickles with the salty meat, and the coleslaw just didn’t cut it for me. 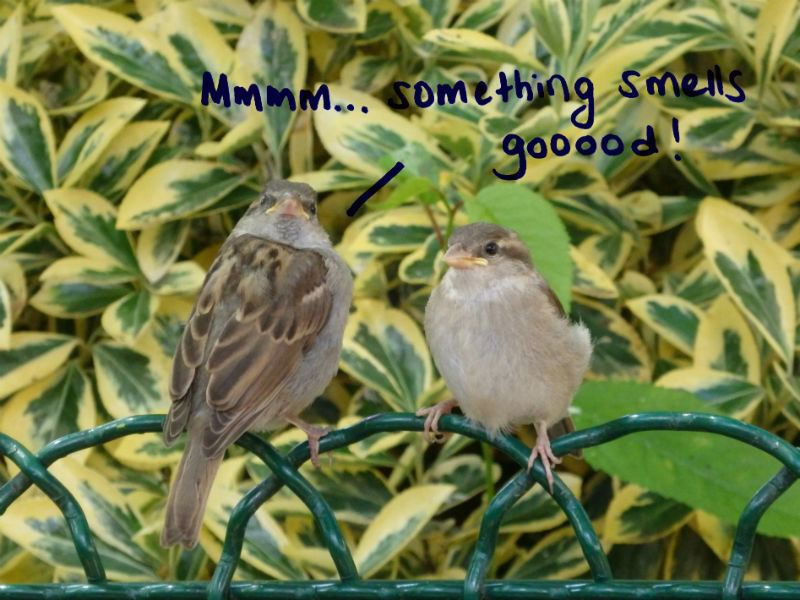 All of them were really filling, and as crumbs and sauce dropped to the ground, the little birds of the park agreed with us that these sandwiches were the real deal! 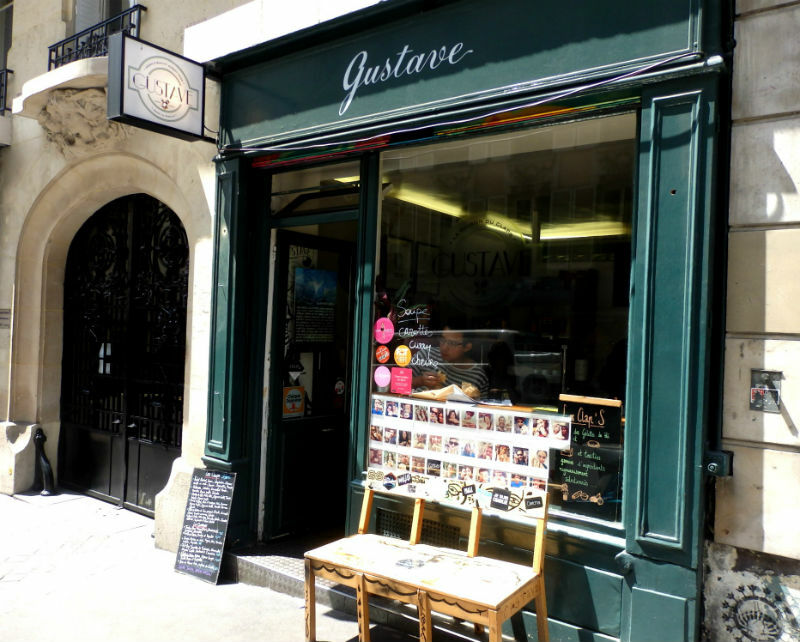 A great place for a low-carb lunch or dinner (as they are open until 10 pm), Gustave is definitely worth a try! Categories: Uncategorized | Tags: hipster, lunch, paris restaurants, sandwiches, snacks, SoPi, trendy | Permalink.